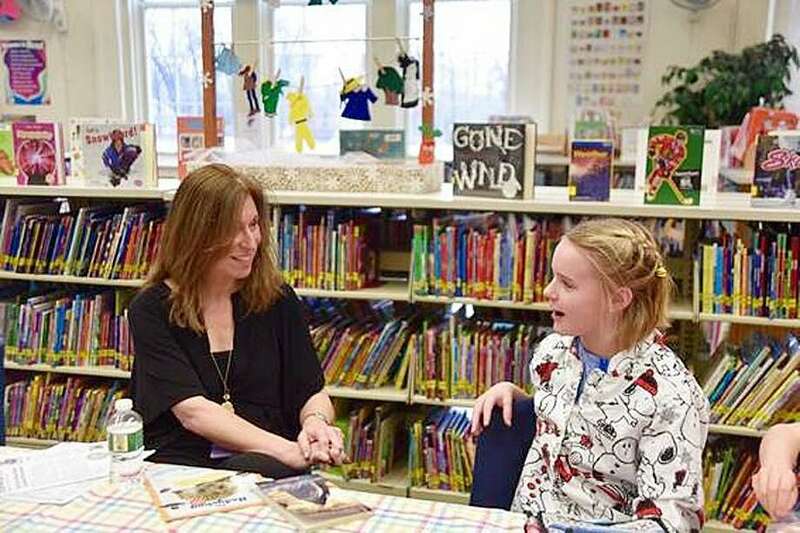 Shea Ward, a Holmes School fourth-grader, meets Lauren Tarshis, author of the popular I Survived series. Four Darien natives, enrolled during the fall semester at The University of Alabama, were named to the dean’s list with an academic record of 3.5 or above or the president’s list with an academic record of 4.0 (all A’s). Matthew Gregory, Caroline Koenitzer and Jacqueline Reardon were named to the dean’s list. Natalie Hartokolis, of Darien, was recognized for achieving the dean’s honor list at Cedarville University. This recognition required Hartokolis to maintain above a 3.75 grade-point average for the semester. James Madison University announced Darien resident Megan Doherty Baird has been named to the president’s list at James Madison University for the fall semester. Students who earn president’s list honors must carry at least 12 graded credit hours and earn a GPA of 3.900 or above. Baird is majoring in interdisciplinary liberal studies. The University of Wisconsin-Madison recognized students named to the dean’s list for the fall semester of the 2017-18 academic year, including three Darien natives. Named to the dean’s list were Megan Johnston, studying at the College of Letters and Science, Peyton Murray, studying at the College of Letters and Science, and Amanda Percarpio, studying at the School of Business. Darien High School students decompressed after midterms and kicked off the second semester on a positive note by attending the 2018 DHS Wellness Fair on Jan. 25. The day included a variety of activities focusing on a healthy lifestyle including ways to stay fit, manage stress, and eat well. Some students practiced yoga, while others learned about the effects of blue light on sleep patterns. At a Jan. 23 meeting, 2018, Darien EMS-Post 53 announced the appointment of a new board chairman: Jay Wood. Wood, financial advisor at The Wood Group/Morgan Stanley Wealth Management, has been a board member since 2012. At the Post 53 meeting, two new board members were also appointed: Evan Cohen, an attorney and partner at Finn Dixon & Herling LLP, and Martha Rhein, a community volunteer. All three are Darien residents. On Feb. 3, 53 Darien High School students in its Authentic Science Research program competed in the Connecticut STEM Fair held at Amity Regional High School. Over 500 students, judges and volunteers participated in the all-day event. Each student was required to create a poster exhibit, make a presentation, and participate in a question-and-answer session with two sets of judges. The judges evaluated entries (both completed projects and research proposals) in four categories: health and medical sciences, physical sciences, environmental sciences, and behavioral sciences. A number of regional awards sponsored by the International Science and Engineering Fair were also presented. A number of DHS students earned top prizes. Two students received additional recognition from the International Science and Engineering Fair. Pfrommer was presented the Mu Alpha Theta Award for the most challenging, original, thorough and creative investigation of a problem involving mathematics accessible to a high school student. Alexandra Swift was presented the Stockholm Junior Water Prize recognizing outstanding water-related research at the high school level. Christine Leventhal, David Lewis and Guy Pratt served as the faculty advisers to the Darien students.